In honor of Halloween, I've decided to write about some of the miniatures that I own which represent monsters from the Cthulhu Mythos. These gigantic spiders are denizens of the Plateau of Leng, mentioned briefly in The Dream-Quest of Unknown Kadath, and later fleshed out in the Call of Cthulhu RPG. There have been various miniatures of Spiders of Leng, but they always struck me as being too pedestrian. However, when I saw the Knobby White Spider (The Force Unleashed #52) from the Star Wars Miniatures Game, the first thing that popped into my mind was that it was a Spider of Leng. The only thing the miniature needs is to be painted purple. The miniature is quite disturbing. I really have the urge to hit it with a mallet when I look at it, and reaching into a box to take the miniature out... Ugghh! The Cats from Uranus are creatures from the Call of Cthulhu RPG. They are described as being similar to the Cats from Saturn, except uglier. There have not been miniatures of either type of cat, but the Bad Kitty (Baxar's War #31) from the Dreamblade CMG would seem to fit the bill for a Cat from Uranus. It is not multi-hued and psychedelic like a Cat from Saturn, but it is definitely hideous. The Moon-beasts were the antagonists in The Dream-Quest of Unknown Kadath, and described as vaguely amorphous grayish-white toad-like beings with a vibrating mass of short pink tentacles on the end of their snouts. On the left is the recent Pathfinder Moon-Beast (Legends of Golarion #29). In the center is the RAFM Moon Beast (RAFM 2941), and at the right is the Grenadier Moonbeast (Call of Cthulhu 222). The Grenadier and RAFM miniatures are very similar, and the Pathfinder miniature is not far off either, though it does not have any eyes. I'll have to repaint the Pathfinder Moon-beast because the pink hands and feet make it look more ape-like than toad-like. The Grenadier Moon-beast is fairly hard to find nowadays, since it is one of the CoC miniatures that has yet to be re-released by Mirliton. Dholes are mentioned in Through the Gates of the Silver Key, and have been described as gigantic worms in later works even though I do not believe they were stated to be worm-like in the story. Bholes on the other hand, were explicitly described as being gigantic worms in The Dream-Quest of Unknown Kadath. It is unclear if they are the same, but both were gigantic creatures dwelling in the Vale of Pnath, so it may very well be that one or the other name came about because of a typographical error. In any event, Dhole was the term used by later Mythos writers, and so we have the Dhole (instead of Bhole) miniature from the Byatis and Dhole box set (RAFM 2030). I really like this miniature, but it essentially is a newly hatched Dhole, since the creature is supposed to be hundreds of feet long (with fleas the size of rats). I'd say that an in-scale miniature would probably have to be at least a meter in length. 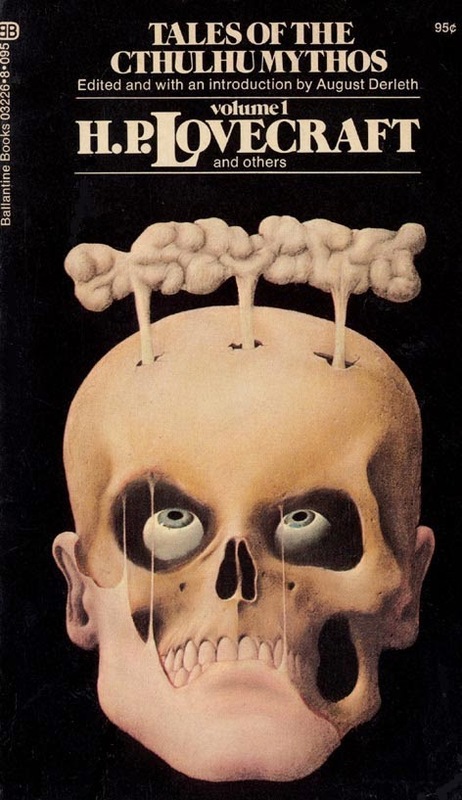 Originally created by Robert E. Howard for his Kull stories, the Serpent Men of Valusia were introduced to the Cthulhu Mythos by Lin Carter and Clark Ashton Smith. 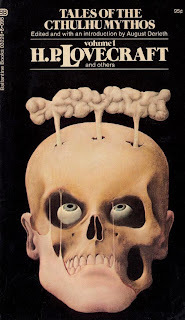 They are mentioned by name in Lovecraft's The Haunter of the Dark. The two miniatures to the left are Ral Partha Serpent Men Heroes (Children of the Night 13-041). These miniatures are currently available from Ironwind Metals. The trio on the right are Grenadier Serpent Men (Call of Cthulhu 6502; Nightmares 619). The Ral Partha Serpent Men do not have tails, which may be more accurate as far as descriptions of Serpent Men go. The Grenadier Serpent Men on the other hand do have tails. The one in red comes from the boxed set, and has been described as holding and orb. To me it just looks like he has his hands clasped together, and I cannot make out any sign of an orb in his hands, so I'm not sure if there is another version of this miniature. Off to answer the doorbell now! 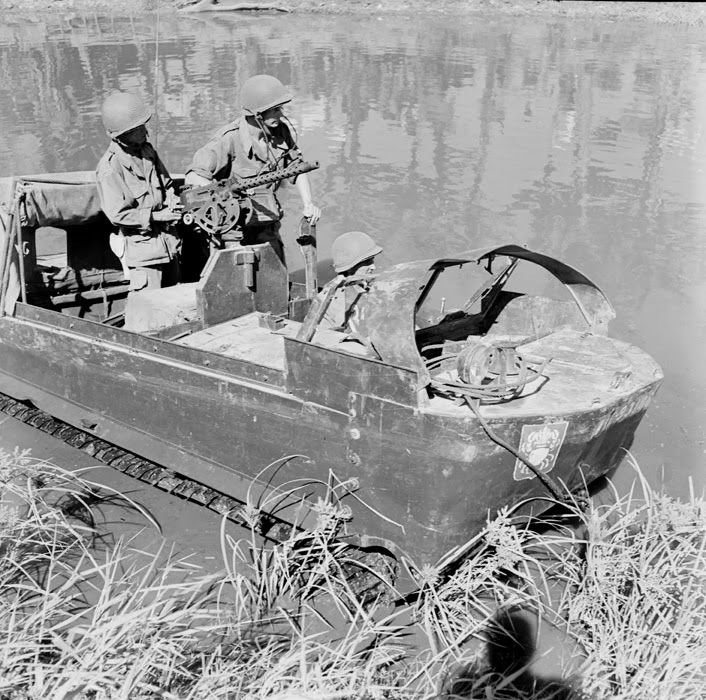 The M29C was was nicknamed the "Crabe" by the French, and used extensively in the wetlands of the Tonkin and Mekong deltas with varying success during their conflict with the Viet Minh. From what I understand, these vehicles were obtained from American surplus in Manilla, and given some modifications for use in Indo-China. 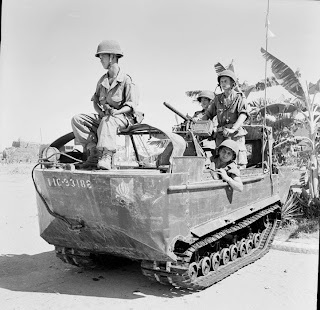 Crabes were given a machine gun mount which typically carried a .30 M1919A4, but could sometimes carry a .30 M1919A6, Bren Gun, FM24/29, or even an M20 recoilless rifle. Vehicles carrying radios may have had the machine gun mounted to the driver's side. 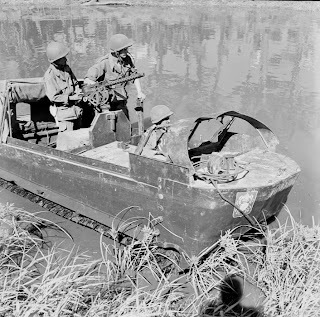 After 1953 they were supposed to carry two machine guns, but I don't think I've seen a picture of how the second weapon was mounted. Some other common characteristics were that the wiper motor and windowpanes were removed from the windshield, and the surfguard was usually in a raised position. You'll see the surfguard dented in, I assume to accommodate people sitting on it. Extratech makes an Indo-China version of the M29C, but it is essentially the same kit as the one produced by Hauler, except with some additional parts. The resin is a light gray, and comes with additional parts for the machine gun, and an expanded photoetch fret including more parts for the mount. 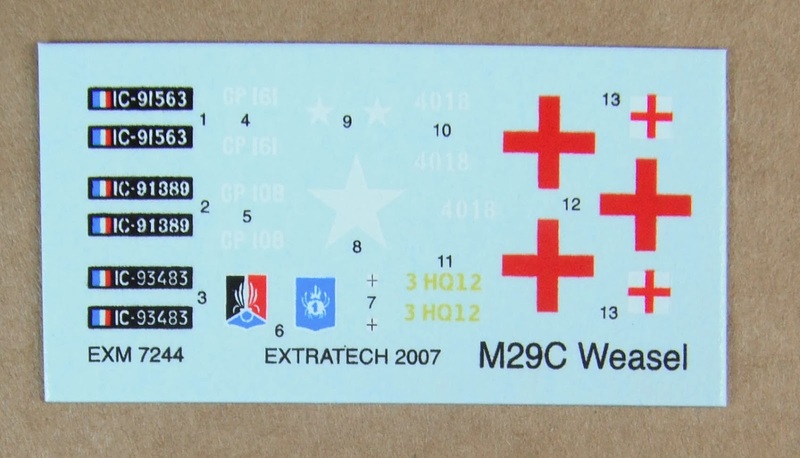 While the kit is certainly nice, I think that the price tag makes it prohibitive to the average modeler or wargamer, so below are some comparisons of the Extratech kit with the more affordable model from Sgts Mess. The level of detail is certainly better on the resin model, and I think that the shape of the bow is also more accurate, but those are minor details I could probably live with for a model that is a quarter of the price of the resin kit. Dimensionally, the metal model is actually 3mm longer than the resin model, but about 0.5mm less in width. If you were to model the Sgts Mess kit with a raised surfguard, that difference would probably be less apparent. I'm not too familiar with the Pathfinder system from Paizo Publishing, and I haven't purchased any of their books so I don't have an opinion regarding their products, but recently I've taken quite an interest in their line of miniatures. Paizo has started filling the void created a couple of years back following the demise of the D&D CMG line with their Pathfinder miniatures. From what I can tell, the miniatures are faithfully modeled after the images used in their artwork. The vast majority are probably too big for 1/72 scale gaming, but as usual, there are always candidates that can be adopted for use. Many of the giant class monsters from the Pathfinder line are similar in size and build to the D&D CMG giants that I use for gaming. Below, from left to right, are the Troll Champion (Shattered Star 036), Fire Giant (Shattered Star 032), and Hill Giant (Shattered Star 031). I don't mind my fantasy miniatures being flamboyant, but the spikes on the Fire Giant were too much for me. I chopped them off, and added some pinheads as more subtle decoration. The tusks and tongue of the Troll Champion are a bit OTT as well, but I think I can live with those. Some of the giant class creatures are less massive than the others. These miniatures have less stylized proportions, so they have a very different look (at least in my eyes) from the other giants. The Stone Giant (Rise of the Runelords 39), and Cyclops (Skulls & Shackles 034) are a lot less imposing than their bulkier compatriots. The pose of the Stone Giant doesn't help, since it make it seem shorter than it actually is, and I'm not too crazy about the moai-like head either. At the other end of the spectrum are the small sized miniatures. Some of them are absolutely tiny compared to 28mm figures, but they look pretty good next to 1/72 figures. From left to right, we have two Derro – Caedimus (Shattered Star 01) and Portioque (Shattered Star 02), a Redcap (Rise of the Runelords 12), and a typical Pathfinder Goblin Warrior (We Be Goblins 01). The Derro are weedy fellows compared to the typical dwarf, but I like them. For some reason, they are how I imagine the Nibelungs from Wagner's Das Rheingold would look. The Pathfinder goblin looks really big because of its over-sized head, but I think that a headswap would make it quite suitable for use as a 1/72 orc. 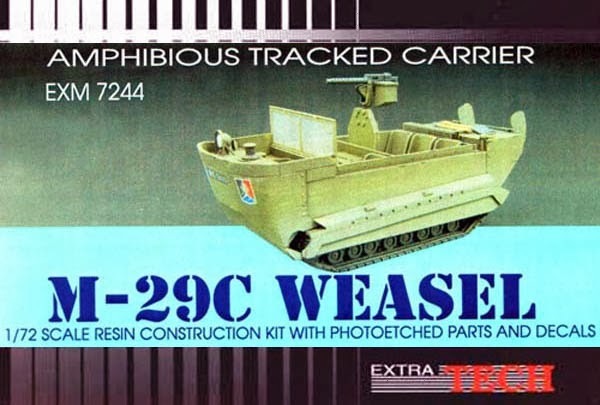 Next, we have miniatures that would be roughly human sized in 1/72 scale. Consistent with the D&D miniatures in the past, Pathfinder gnomes and halflings can easily pass as humans. From left to right are a Gnome Fighter (Heroes & Monsters 22), Rosie Cuswell (Skulls & Shackles 038), and a Harpy (Rise of the Runelords 08). The gnome is on the short side, but he still looks in scale. I had to fix the halfling up a bit, because the paint was layered on really thick, leaving various lumpy areas all over her arms. I think that she's holding a violin bow in her right hand, but it's the size (and shape) of a cleaver. Again, the harpy is a Pathfinder miniature that would look small next to a 28mm figure, but fits in almost perfectly with 1/72 scale figures. One of the more iconic monsters from the Fiend Folio that finally makes its appearance in miniature form is the Caryatid Column (Shattered Star 020). This is the figure that really got me to look into the line of Pathfinder miniatures. They are modeled after actual caryatid columns (although armed with swords), and can be used as architectural details or monsters. Maybe it's just me, but I found the two round things on top of the Clockwork Reliquary to be a rather unfortunate design choice. The skeleton in the Reliquary is also obviously too large even for 28mm figures (though I guess it could be the skeleton of a giant). To remedy the situation, I decided to take the miniature apart. I found some plastic Mega Bloks flames, which I will place on top of the model (I'm undecided as to whether to use the large flame or the small one). I wanted to open up the crystal and replace the skeleton inside, but I think it would be very difficult to do so without damaging the clear plastic. I'll probably use the Dark Art to replicate the crystal, and cast a replacement with a skeleton embedded inside. The Forgefiend is another model that is crying out for enhancement. I am going to install an LED as described at SeanKReynolds.com, though I'll probably run the wires through its legs and out the bottom of its feet. I've already used acetone to remove the paint from the Forgefiend's mouth and eyes, so that they will glow when it is lit up. 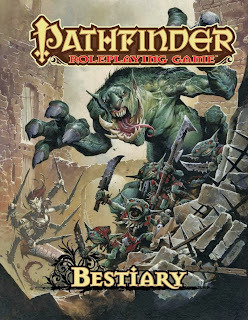 Anyway, my overall impression is that the Pathfinder miniatures are a worthy successor to the D&D CMG line. There have been some people complaining that the figures are not as durable as the D&D miniatures, but I have not found that particular problem. The larger models do seem to have some parts made of a harder plastic, so they may be more fragile, but I haven't really had anything come apart unless I was trying to do it on purpose. "And the four beasts had each of them six wings about him; and they were full of eyes within". The Burning Ones are the most bizarre of angels described in religious texts. 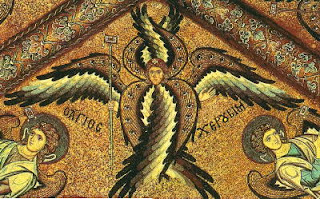 They have been variously depicted as being covered in eyes, having the head of a lion, ox, or eagle, or as dragon-shaped, but they invariably have six wings. The Dreamblade CMG had a Seraph miniature (Chrysotic Plague #08) that can often be found for under US$1. It comes in the standard six-wing configuration (or maybe I should say that it has six major wings), but it has no head. It was a simple enough matter to put a pin into the miniature and add a head. The head was taken from a Female Adventurer with Shield and Sword from the Adventurers box set (Ral Partha 98-002). Don't worry, she'll recover after getting a new 1/72 head. I've been too busy with work and RealLife™ recently to play with my toys, but things are getting back under control, so I'm able to get back to more enjoyable things. But before that, I'll start with a bit of disappointing news. Back in July I thought that I found the solution to bonding rubberband tracks, but I could not have been more wrong. I'm not sure if it was the recent bout of hot, dry weather, or if the bond just weakened in general over time, but I was looking at my CaféReo tanks last week, and ALL of the tracks that I attached with Shoe GOO separated at the join! Now I need to find a new way to glue these tracks. 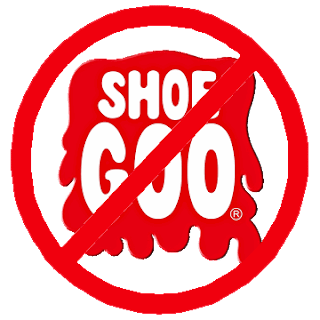 Some people have recommended E-6000 for bonding rubber, but it's made by the Shoe GOO people, and sounds pretty much like the same product. Anyone else have other suggestions?